The huge outside garden is very private where your families and friends could enjoy. All prices are per villa per week (in Euro - €) for groups of 4, 5, 6, 7, 8,9 and 10 persons. The prices include electricity, water, gas and one set of bedding per person (given on arrival).Basic price (for 1-4 person) is 700€ for high season (01 Jun -30 Sept), 300 Eur. for mid-season ( 01. Oct - 30.Nov), For middle season 450 eur. (01 Apr - 31 May), 200 € for low-season (01 Dec.. -31 Mar). For each additional person we charge 70€ for high season, 40€ for mid-season, 20€ for low-season. 40 Euro is added to rental price for final cleaning. i am owner of the villas. My profile photo is on the veranda of my own villa (family villa). The rental villas was built in 2000 by me.The place of the villas realy very tranquil, very peacefull. Because it is realy very tranquil, very peacefull.. Also it has a private strand pool. it is direct to the bach. natural beach. The rental prices is realy very reasonable price. Unit prices are in EURO per villa per week. Reservation is make for weekly period stay. All prices are per villa per week (in Euro - €) for groups of 4, 5, 6, 7, 8,9 and 10 persons. The prices include electricity, water, gas and one set of bedding per person (given on arrival).Basic price (for 1-4 person) is 700€ for high season (01 Jun -30 Sept), 300 Eur. for mid-season ( 01. Oct - 30.Nov), For middle season 450 eur. (01 Apr - 31 May), 200 € for low-season (01 Dec.. -31 Mar). For each additional person we charge 70€ for high season, 40€ for mid-season, 20€ for low-season. 40 Euro is added to rental price for final cleaning. 30 % of the total amount of the rent should be paid as a downpayment to our bank account. Unit prices are in EURO per villa per week. Reservation is make for weekly period stay. Basic price (for 1-4 person) is 700€ for high season (01 Jun -30 Sept), 300 Eur. for mid-season ( 01. Oct - 30.Nov), For middle season 400 eur. (01 Apr - 31 May), 200 € for low-season (01 Dec.. -31 Mar). For each additional person we charge 70€ for high season, 40€ for mid-season, 20€ for low-season. 40 Euro is added to rental price for final cleaning. 30 % of the total amount of the rent should be paid as a downpayment to our bank account. AT OUR FURNISHED VACATION VILLA LOCATED NEXT TO THE SEA AND NEARBY THE ANCIENT ERYTHRAI (ILDIR) VILLA OF CESME YOU CAN: - Have a tranquil and peaceful holiday with your family, - Enjoy the sea and sun at the clean sands of our beach - Connect Internet access available ( 1024 Mb. DSL) - Rent one of our various models cars during your stay, - Use our transfer service round trip the airport, - Arrange daily historical or sight-seeing tours to different places you desire, - Transmit all your requirements to your house- owner speaking English or German. Great overall- the Villa, the sea and the Host!!! We stayed in Villa Banu during the after season with 4 adults and 3 kids. The house offers all comfort and facilities you might wish during your holiday. The beach is very close by so is a grocery for your basic needs. The landlord is extremely helpful and caring and a nice person to chat with. We would definetely recomend this beautiful spot even when the season is over like the time we were there. Villa banu is located around 5 mins drive from the village of Ildir and around 30 mins drive from Cesme. The location is quiet and peaceful and the beach is at the end of the garden. There is a small shop at the end of the road with a very friendly shopkeeper. There are restaurants (one in particular was really nice and the owner would even give as a lift back home again) in nearby Ildir which can be reached by the local bus which stops at the end of the road next to the shop. The villa was clean and well maintained and the pictures on the website are an accurate description of the villa. The owner was very helpful and arranged car hire for us as well as airport transfers. The location of the villa is a bit remote and I would advise you to hire a car as although the local bus can take you to either Ildir or Cesme it is much quicker to drive. The location is perfect if you would like somewhere peaceful to relax and there is plenty of space for a large group. My family and I have visited Villa Banu on four separate summers for 2-3 weeks each time. Our opinion of the villa, landlord, and location is evidenced by the number of times we have returned. The Villas are nicely kept, spacious, clean and the grounds beautiful. The owner is very attentive and helpful in taking care of the needs of his guests. A full kitchen and outdoor grill allow us to prepare our own food drawing on the wonderful local produce, fruits, and meats. A full grocery store is within a 5 minute drive from the villa. We enjoy our dinner on the balcony as the sun sets over the Aegean Sea. The villa’s location is slightly outside the main town and the other vacationers in the area are mostly nationals so it has a family vacation feel rather than a tourist feel. Being on the periphery also allows for cycling, walking, and jogging on quiet roads. But, if you want a touristy flavor, it is only an easy 10-15 minute drive to Ilica, Alacati, and Cesme. Shopping, windsurfing, eating out, visiting the ancient ruins of Ephesus or walking the busy streets of Izmir are all easily accomplished from the villa’s location. For us Villa Banu is a perfect combination which offers quiet leisure time lounging at the villa, sporting activities, and traditional tourist activities all according to our timetable from our home away from home on the Aegean. It really is a great spot for a vacation. By chance, we've spent our holiday in 2011, at the Banu Villa. Now, I can say that it was an excellence choice. The villa is clean, with all the facilities you can think about, the spaces are large - the living room is a pleasure. The host is a pleasant and discreet person, a very good guide for the activities you want to do. Do you want to swim early in the morning or at the sunset ? OK! You have the beach at 50 m ! Do you want a wonderful beach with white sand? Ilica is at just a few km from the villa! Do you want peace, quiet? You can drink your coffee on the terrace, admiring the sun rise, or you can see the most beautiful sun set of your life. I've done all of these! We were 10 persons - 6 adults and 4 kids, and spent an excellent holiday. We visited Cesme, Ilica, Alacati - places full of interesting attractions, Eritreea - historical site. I think this place is a good one for families with children, for people who like to spend a calm holiday! Shops and restaurants are within 200 to 2000 m from the villa. 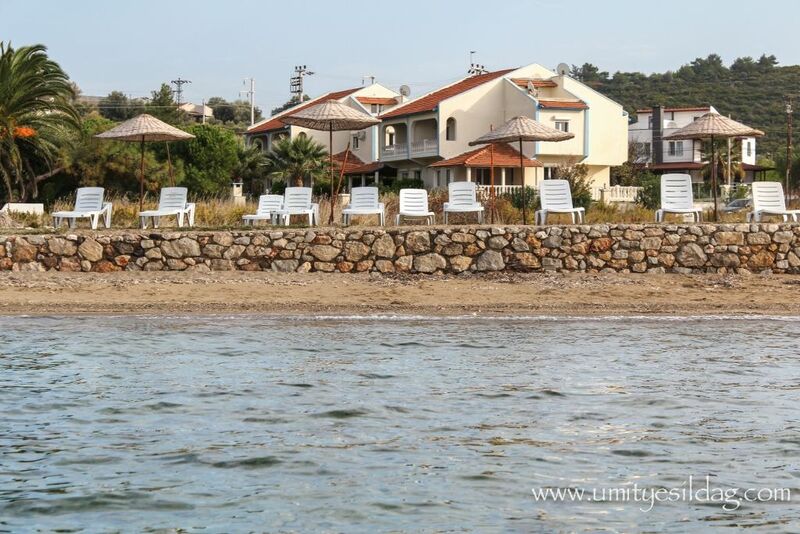 The beach is 50 m directly in front of the villa and is within walking distance. Easy access by buses to Ildir village, Ilica and Cesme every 30 minutes. There is also a daily bus service to Izmir which runs every hour. Car rental and transfer to and fro the Airport to our villa are available upon request. Basic price (for 1-4 person) is 770€ for high season (01 Jun -30 Sept), 300 Eur. for mid-season ( 01. Oct - 30.Nov), For middle season 400 eur. (01 Apr - 31 May), 200 € for low-season (01 Dec.. -31 Mar). For each additional person we charge 77€ for high season, 40€ for mid-season, 20€ for low-season. 40 Euro is added to rental price for final cleaning.